After a little casting snafu saw Al Pacino replaced at the last minute by Benjamin Bratt, the July release of Despicable Me 2 is still on track, and the hype machine is kicking into full gear. 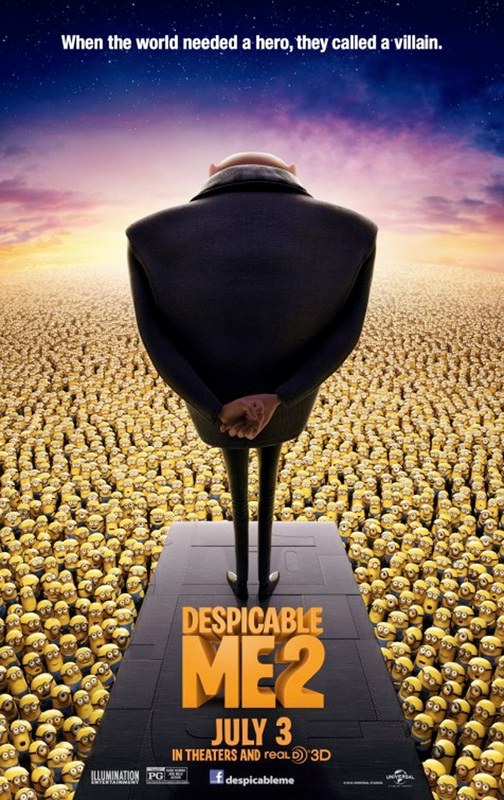 A brand new poster has just been unveiled featuring Gru (voiced by Steve Carell) looking over an impressive sea of his little, weird, yellow followers, the minions (who are also getting their own movie). The animated sequel from Universal and Illumination Entertainment introduces audiences to Eduardo (Bratt), a new super-criminal causing problems for The Anti-Villain League, which decides to recruit Gru to help them eradicate this new threat. "Steve Carell is reprising his role as the despicable Gru (along with his three adopted daughters) with Al Pacino voicing his nemesis for the sequel." May want to update that with Bratt rather than Pacino. So their doing "The enemy of my enemy is my friend" bit? Okay. "You do not know pain, you do not know fear. You will taste man-flesh!" Haha! Nice. Must mean Gru is after the Halflings.